If you have the Moon in Leo, you are warm, generous, and loving in your affections and you bring out great devotion and loyalty in your loved ones. You want to be worshipped and adored like the king or queen you feel you are. You want and need a partner you can be proud of and your own pride is very important to you. You cannot love someone you don’t respect and aren’t proud of. It is important to you that you feel recognized and appreciated. Your feelings get hurt when you feel ignored. You dislike emotional games and dishonesty. You are popular, generous, dignified, loyal and ambitious and have a persevering, penetrating mind with leadership and creative ability. You dramatize the events in your life and your feelings. On the negative side, you may be ego-oriented, vain and/or ostentatious with a tendency to wear your heart on your sleeve. 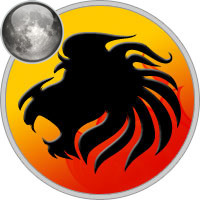 With Moon in Leo you are gregarious to the point of getting even others to perform; you love display and dramatizing situations. Always managing to find a creative environment or the creative in the environment, you’re great with kids, animals, sports, and the outdoors. You’re an umbrella of warmth, friendship and self-expression, but need to learn to govern your emotions. You want your own way, and strive to have it. You’re proud, easily offended, and need to be the center of attention. You have a subconscious desire to be in authority as well as a hidden drive for power—"hidden" and "subconscious" because that’s the nature of the Moon, "authority" and "power" because that’s what Leo demands. In a male chart this would attract a dramatic and positive mate.